The basic concept of counting is beyond most animals, but not hyenas. They are able to count almost as well as primates, another indicator that these carnivores are unusually intelligent. It all goes back to their sophisticated, hierarchical societies. Hyenas don't generally get a lot of credit for their intelligence - personally, I blame The Lion King - researchers have repeatedly demonstrated that hyenas' cognitive abilities rival those of monkeys. Now new research from Michigan State University suggests that hyena intelligence likely evolved as a way to keep track of their social groups. And that's where the ability to count enters the picture. Sarah Benson-Amram and her MSU colleagues recorded a series of hyena whoops, and then played them for hyenas in Kenya's Masai Mara National Reserve. The whoops were from hyenas that belonged to different clans than those of the hyenas in the study, so they would be expected to respond to these calls as signs of potential intruders. The researchers wanted to see how attentive the hyenas became depending on how many calls they heard. Many of the hyenas showed a clear ability to distinguish the number of calls they had heard, becoming more pensive and attentive after hearing three calls than after hearing one or two. Crucially, they responded not just to the number of calls but the number of unique calls - they seemed to be able to recognize the presence of multiple intruders and respond accordingly to the greater perceived threat. That may seem like a fairly basic ability - and to us, it would be - but that ability to count how many intruders are present is very difficult to find in other animals. 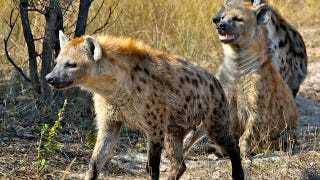 Even more impressive is that the hyenas never heard the whoops together, but only separately. Previous studies that demonstrated similar behaviors in howler monkeys and lions only played the calls all at once, leaving open the possibility that these animals were merely responding to the amount of noise, not the specific number of intruders. Hyena society is shockingly complex - clans grow as big as 90 members, and each features distinct subgroups that often clash with each other. The only real equivalent for these societies can be found among primates, which makes them the perfect test case for what's known as the social intelligence hypothesis, the idea that the presence of complex society necessitates the evolution of increased intelligence. In terms of social skills, hyenas have already displayed considerable intelligence - they're able to keep track of the social statues of the other 90 or so members of their clan, and they're able to tell who is a part of their particular sub-unit. The ability to count, even if it's only to three, is a crucial example of a non-social form of intelligence. Even a basic understanding of number would be hugely useful in determining when to fight opponents and when not to. The social intelligence hypothesis becomes even more compelling when you compare the behavior of hyenas to other carnivores. Lions, for instance, are "surprisingly robot-like" in their interactions and responses, according to fellow researcher Kay Holekamp, suggesting they are creatures more of instinct than intelligence. Perhaps not coincidentally, they also live in far smaller groups than hyenas do, which means they lack the sort of social complexities that seemingly force hyenas to think on their feet. Animal Behavior via Nature. Image by jurvetson on Flickr.